Natural disasters are major adverse events that cause large-scale economic, human, and environmental losses. They are usually difficult to predict and it is even more challenging to prevent them from happening. These characteristics demand disaster management strategies to be in place for the mitigation of damaging consequences when a disaster happens. 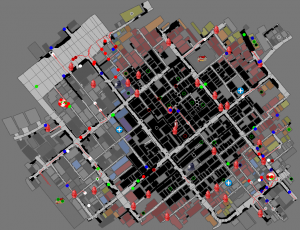 This competition involves primarily evaluating the performance of agent teams developed using Agent Development Framework (ADF) on different maps of the RoboCup Rescue Agent Simulation (RCRS) platform. Specifically, it involves evaluating the effectiveness of Ambulance, Police Force, and Fire Brigade agents on rescuing civilians and extinguishing fires in cities where an earthquake has just happened. The purpose of this competition is to provide a common benchmark to demonstrate scientific progress in the application of robotics to Urban Search and Rescue. The rules of this competition are loosely inspired by the rules of the RoboCup Rescue Robot League and of the Agent Competition of the RoboCup Rescue Simulation League. As in the Rescue Robot League, a devastated area has to be explored for victims by a team of robots controlled by an operator. Compared to the Rescue Robot League, the focus is on exploring larger areas with multiple robots rather than the mobility of individual robots. As in the Agent Competition, the disaster situation is not known before a competition run. The main difference between the two simulation competitions is our focus on realistic sensory and actuation in addition to planning. The Infrastructure competition involves the presentation of tools or simulators related to disaster management issues already developed by the participating team. 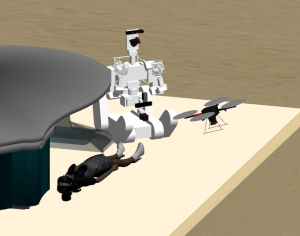 The aim is to evaluate possible enhancements and expansions of the RoboCup Rescue Simulation League environment (both the agent simulator and the virtual robot platform) based on the new ideas and concepts proposed in these tools and simulators.